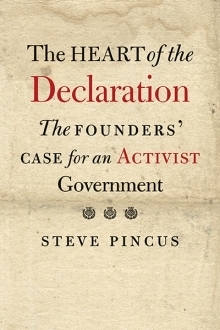 Following on from Ken Owen’s review of Steve Pincus’s The Heart of the Declaration: The Founders’ Case for an Activist Government (New Haven: Yale University Press, 2016), we continue our Review/Q&A format with an interview with the author. Steve Pincus is the Bradford Durfee Professor of History at Yale University and author of 1688: The First Modern Revolution (2009) and Protestantism and Patriotism: Ideologies and the Making of English Foreign Policy, 1650-1668 (1996), editor of England’s Glorious Revolution 1688-1689: A Brief History with Documents (2005), and co-editor of A Nation Transformed: England After the Restoration (2001) and The Politics of the Public Sphere in Early Modern England (2007). JUNTO: As a prominent historian of early modern Britain, you have recently written a number of things dealing with early America. Why is that and what is it specifically about colonial America and/or the American Revolution that has piqued your interest as a historian of the British empire? PINCUS: I am a historian of the British Empire in its global context. So, British America has long been in my vision. But as I was working on my book on the British Empire in the 17th and 18th centuries I felt compelled to read through early American historiography with renewed intensity and interest. I was struck that much of that historiography took for granted three assumptions about Britain and its Empire that I no longer believed to be true. First, much of the literature assumes that Britain had a weak or classically liberal state. In fact, since the seminal work of John Brewer, British historians know that the eighteenth-century British state was remarkably robust. In my own research, conducted with the Chicago political scientist and economist Jam Robinson, I have discovered that not only was the British state strong but it spent much more of its revenue on colonial development than did its imperial rivals (the results of that analysis were published in the French journal Annales in 2016). Second, I, along with many of my colleagues, have come to reject an analysis of British politics that allowed no place for ideology and partisanship. That view of British politics, classically associated with the pioneering work of Sir Lewis Namier, simply does not comport with the rich and fierce ideological divisions in eighteenth-century Britain. The center of ideological contestation I have found was about how to govern the British Empire. Third, much of the debate about the imperial constitution has long operated under the assumption that eighteenth-century Britons in America and in Britain itself assumed that sovereignty was unitary and indivisible. So, it has been said that the Americans plumped for notions of popular sovereignty as against the sovereignty of Parliament. In fact, commentators beginning with Don Herzog have noticed that in practice and in theory many rejected notions of unitary sovereignty. Britons were well aware, for example, that the English East India Company exercised some state-like functions. They knew that in Ireland sovereignty was exercise in part by the Irish Parliament, in part by the King, and in part by the British Parliament. Patriots on both sides of the Atlantic took to arguing that modern polities were complex; that sovereignty was never unitary. Armed with these three discoveries, I thought it was time to revisit debates about the Revolution and America’s founding documents. JUNTO: Your book focuses on an empire-wide debate over political economy and the political economic direction and nature of the empire. For those who have not yet read the book, could you briefly break down the parameters of that debate? PINCUS: The Revolution of 1688-89 was in large part about competing visions of political economy. In the eighteenth century those partisan arguments became both more sophisticated and more intense. The book takes up the story in the 1720s and 1730s. At that point the establishment Whigs, led by the Prime Minister Robert Walpole and a sophisticated group of writers in the periodical press and in pamphlet literature, argued that the key to British prosperity lay in imperial production. They placed particular emphasis on the West Indian sugar colonies as the most profitable and valuable parts of the Empire. For the Walpolian establishment Whigs, the key to wealth lay in production by human labor–whether free, indentured or enslaved. In fact Walpolian polemicists insisted that slave colonies were the greatest boon to the imperial economy. Walpolians were also obsessed with the national debt that had ballooned during the War of the Spanish Succession (Queen Anne’s War). They therefore wanted to spend as little as possible on colonial development. They also wanted to avoid expensive wars with Britain’s imperial rivals at all costs. They valued the South Sea Company because the government received a significant cut from the profits reaped by selling slaves and British manufactured goods to Spanish America through the Company’s monopoly. Walpole’s Patriot Whig opponents developed an alternative political economy in a variety of pamphlets and Patriot newspapers–Common Sense and the Craftsman in England. Colonial newspapers and newspapers in Scotland and Ireland largely followed the Patriot lead. While they accepted the Walpolian tenet that labor was crucial to the creation of property and prosperity, they insisted against the Walpolians that sustained economic growth depended on the creative interplay between producers and consumers. Consumers needed to be able to buy goods to allow for the manufacturing sector to develop and expand. They therefore saw little value in slave societies–in which there would be very few consumers. Instead they advocated subsidizing immigration to help create more colonial consumers. Since growth depended on consumption as well as production, the Patriots also wanted to capture overseas markets. They saw Spanish America as a providing huge numbers of consumers. This was because as silver production boomed in Mexico and Peru, and indigenous production of cloth was curtailed, Spanish American demand for European manufactured goods was almost limitless. Patriots therefore wanted to pry open Spanish American markets. They therefore thought it was worthwhile going to war to open those markets. Eventually they forced the Walpole administration to begin that war–the War of Jenkins Ear. To sum up: from the 1720s and 1730s there was a fierce political economic debate across the British Empire about whether to pursue an extractive economic strategy focused on the slave colonies, or to pursue a developmental strategy that sought to create colonial consumers and open up foreign markets for British manufactured goods. That debate persisted through the imperial crisis of the 1760s and 1770s. JUNTO: Isn’t it the case that both sides are arguing for activist government but wanting that activity to take different forms? PINCUS: Yes, in a sense. However, it is important to realize that both sides had very different views about government spending. The establishment Whigs–those that supported Walpole’s government and those that supported George Grenville and Lord North–were obsessed by the ballooning national debt. They therefore sought to avoid war. They sought to curtail or eliminate the substantial bounties provided for colonial economic development. After 1761 they sought to radically restrict expenditures on infrastructure in the colonies, in Ireland and in Scotland. They wanted to spend little on protecting British merchant ships. Grenville and North wanted to eliminate all subsidies to support immigration. The establishment Whigs, however, did want the government to be active in suppressing slave rebellions, in curtailing civic unrest in Britain, and in negotiating peace agreements with competing imperial powers. They also sought more energetic and efficient collection of taxation. Establishment Whigs accepted the necessity of the state. But they often described it as a necessary evil. Patriots, by contrast, wanted to state to spend money on colonial development. They advocated building roads and harbors from Ireland to the West Indies. They called for bounties made payable in the colonies to promote colonial development. They frequently argued for state subsidization of immigration. The Patriots, for example, insisted that the new colony of Georgia would only survive and prosper if the state supported new immigrants and provided them with start up costs. Patriots believed that the only to pay down the debt was through promoting growth in the colonies. Indirect taxation of British manufactured goods would generate the revenue to pay down the debt. The vast majority of Patriots were enthusiastic supporters of the modern state. JUNTO: Why do you think historians of colonial America and the American Revolution have missed this debate and its importance in shaping the coming of the Revolution? PINCUS: I think a great deal of this has to do with the divorce between British and early American history. The generation of scholars led by Edmund Morgan and Bernard Bailyn were deeply engaged with British historiography. They knew about and developed the implications of British cutting edge scholarship. They asked what did that scholarship imply about the way we should think about early America. It was Bailyn and Morgan, above all, who insisted that early Americanists wrestle with the implications of the work of J. H. Plumb and Lewis Namier. This creative interplay between the two sub-fields has been, with a few notable exceptions, lost in more recent scholarship. British historians, at the same time, stopped reading and engaging with early American scholarship. Much of British historiography of the eighteenth century turned away from the kinds of questions in which early America would have been central. Indeed the elimination of Oxford’s popular special subject on the Imperial Crisis (which may now be about to be revived) was symptomatic of the mood. The New Imperial History of the eighteenth century did something to revive interest among British historians. But that historiography focused more on cultural questions. The political economy of Empire and the development of imperial institutions was not central to their concerns. This has been a great missed opportunity. In my view the neo-progressive historian’s interest in class contest would have benefitted from an imperial dimension. It remains for future scholars to connect the agitation that Gary Nash carefully described in Philadelphia and New York with the Spitalfields riots in London, and the popular movement for economic reform in Ireland. Similarly the turn to a continental approach to early America could have gained a great deal by connecting developments on the frontier more thoroughly with imperial struggles. Future scholars will, ideally, connect Indian history with imperial histories in a more sustained way. Colin Calloway has already provided some really useful hints as to how to do this. JUNTO: For those who haven’t read the book, can you say something about the importance of India (and/or “the rest” of the British Empire) to the coming of the Revolution? PINCUS: India has long been marginalized in both imperial history and early American history. (though Jonathan Eacott’s new book is a welcome addition to the literature). The British conquest of Bengal at Plassey and the assumption of the Diwani in 1765, however, played a central role in the coming of the Revolution. Robert Clive developed a militarized extractive state in British Bengal in the 1760s, promising his close friend George Grenville that his policies in India would generate millions of pounds in revenue that could be used to pay down the British debt. In fact, Clive’s policies served–according to recent scholarship including the work of Prasannan Parthasarathi–in the de-industrialization of Bengal. Bengal had long been producing fashionable cotton-based products that were in great demand among fashionable European consumers. Bengali production was on an immense scale in the eighteenth century. But by the middle of the nineteenth century Bengal was importing large quantities of Manchester produced clothing. Patriots on both sides of the Atlantic were deeply critical of the Indian policies pursued by Robert Clive and supported by George Grenville and Lord North. Increasingly British Americans came to look upon what was happening in Clive’s India as a prologue to what was beginning to happen to them. The popular Newport minister Ezra Stiles drew parallels between Clive’s activities and the Stamp Act. He began to gather materials for a history of India. Thomas Paine’s first major literary production on American soil was a condemnation of Clive’s policies in India. I was Britain’s Indian policy that provided the context for Patriot understandings of the taxation schemes of the 1760s and for the deployment of Thomas Gage’s forces in North America. Any policy that sought to support the East India Company, in Patriot eyes, was a policy that furthered the policy of extractive empire. JUNTO: Where/How do you see your work fitting into the historiography of early America and the American Revolution? PINCUS: In a broad sense I see my book as charting a middle way between the interest-based interpretations of progressive and neo-progressive historians, on the one hand, and ideologically driven interpretations on the other. I agree with the interest-based historians that material self-interest mattered deeply in motivating the choices made by groups and individuals in the eighteenth century. But I argue that ideas were vital in determining how individuals and groups came to understand their self-interest. And, I suggest, those ideas about self-interest were shaped by a transatlantic and trans-imperial debate about political economy. I never use the word “republican” in the book. This is not because I don’t believe republicanism existed. I know there were many republicans on both sides of the Atlantic. But I wanted to sidestep what seems to me increasingly scholastic debates about the meaning of republicanism. I wanted to highlight the importance of political economy in shaping the Declaration and in establishing the context for the outbreak of the American Revolution. The Patriots, by and large, adopted a kind of commercial republicanism. They were not enemies to the Bank of England, to the establishment of government debt, or to activist government. They did, by and large, want more participation in government–in no small part because they thought that only by increasing political participation could governments gather the kind of social and economic information that they needed to make good policy. They saw no tension between republicanism and commercialization. I follow Chris Brown in believing that there was an active anti-slavery movement among the Patriots in the 1760s and 1770s. Far from fearing the result of Lord Mansfield’s decision in the Somerset case, they lamented the narrowness of the decision. They lamented the fact that Mansfield appeared to reaffirm William Blackstone’s notion that there was one law of slavery appropriate in Europe and another in the colonies. Most Patriots took this position because they believed that slave societies were intrinsically hierarchical and economically inefficient. There was a real opportunity lost in the revolutionary moment. Recent terrific work on the Declaration (by the Harvard political theorist Danielle Allen) has highlighted two elements that I fully endorse: that America’s founding document was pro-state and that it was committed to promoting equality. She is completely right. But I would add that the Patriots were also committed to the notion that equality could only be achieved by a state active in the economic realm. Political economic activism, in the view of Patriots on both sides of the Atlantic was a prerequisite to achieving greater social equality. JUNTO: There is a presentist framing of the book. Is that something you intended from the beginning and why is the book’s argument/message important in the present moment? PINCUS: I don’t think of the book as presentist except in the sense that the transformations of commerce, the state and ideas in the long eighteenth century created the modern age in which we still live. As such, I think 21st century politicians, commentators and jurists are right to think of this period as being full of resources for thinking about contemporary politics. So in researching and writing the book I sought to tell a new kind of story about the eighteenth century that I always thought might help us think through some contemporary issues. But I researched and wrote as a historian first and foremost. I wanted to get the story about the eighteenth century right. I wanted to bring to light issues and developments that I thought were essential to understanding the Declaration and had been given too little attention. I think understanding the Declaration as part of an attempt to create an American government is important. So many politicians assume that America’s founders were skeptical about government. In fact, they were resentful about Britain’s imperial government for doing too little to promote their development rather than because they were doing too much. In particular Patriots on both sides of the Atlantic wanted the British government to do more to promote immigration to the colonies, to do more to support colonial and British trade with Spanish America, and to put an end to the slave trade which they saw as a social and economic form appropriate only to primitive societies. JUNTO: You’re now working on a much larger project from which this book derived. Can you tell us more about that larger project? PINCUS: For well over a decade I have been working on a global history of the British Empire in the 17th and 18th centuries. That book looks at the British Empire in Scotland and Ireland, Jamaica and Barbados, Bombay and Bengal, Tangier and Gibraltar, as well as North America. It is an immense project–so immense that each discovery leads to new questions and new archives. Debates about the British Empire were central to British politics from the late seventeenth century. Debates about the Empire were bitterly partisan, not only in England, but in Jamaica, Bengal, Dominica, Tangier, South Carolina, Nova Scotia, New York and beyond. Local conditions invariably shaped those partisan debates. But, local actors sought to connect their concerns with a variety of imperial institutions. Those imperial actors and institutions, in turn, refined, revised and reshaped their activities and arguments based on what was happening on the ground in the Empire. The near simultaneous emergence of the colonial and British provincial press meant, and their creative interaction, meant that Pennsylvanians knew an immense amount about London city politics, that inhabitants of Ireland were intensely aware of the political and commercial concerns of Jamaicans and South Carolinians, and that opponents of Robert Clive in Bengal connected their plight with the plight of West Florida and Massachusetts. Labor regimes, economic policy and imperial economic and geopolitical competition were central to the debates about Empire throughout the 17th and 18th centuries. That book is based on research in over 150 archives in many different countries. It is also, at this point, very very long. So, in many ways The Heart of the Declaration is an interpretative essay bringing some of my findings in that work to light in a more digestible form. In The Heart I wanted to suggest ways in which that research could open up new questions and new debates in early American history. In a sense I wanted to return to the project of connecting British and early American history that Bailyn and Morgan had begun, but with new methodological and interpretative insights based on the scholarship of the past half century. Great Q&A. Does Pincus really call his collaborator “Jam Robinson”? Those guys must be tight. Really informative Q&A. I was really struck by the idea that most Patriots disliked the narrowness of the Somerset decision. Did Patriots outside of New England complain about the case not applying to the colonies as well? Yes that is what I meant. Sorry for the typo!